The "willow" design background on JoMA's Home Page (and other pages) is by the great 19th century designer/craftsman/ socialist/fantasist William Morris. Here's a fascinating little film put together by NPR's Bryant Park Project as a tribute to Madeleine L'Engle and her novel, A Wrinkle in Time, which makes use of the "tesseract," a rather confusing and imaginative appreciation of the fourth dimension. 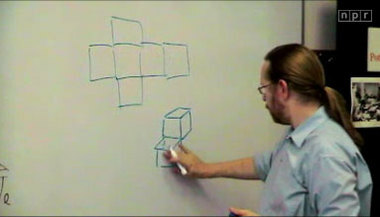 NPR interviewed Physicist David Morgan to explain how the tesseract functions to illustrate multidimensional space. Very cool...but the film's file is big...so be patient and let it load first-- it's worth it. You can also click on the little box in the lower right hand corner of the film and see the film full screen. The Journal of Mythic Arts was a pioneering online magazine dedicated to Mythic Arts: literary, visual, and performance arts inspired by myth, folklore, and fairy tales. Published by The Endicott Studio, co-edited by Terri Windling & Midori Snyder, JoMA ran from 1997 to 2008. This blog was active from 2006 - 2008, and is kept online as an archive only. Please note that no new material has been posted since 2008, and links have not been updated. For more recent discussions of Mythic Arts, fantasy literature, and related topics, visit Terri Windling's Myth & Moor and Midori Snyder's Into the Labyrinth. Visit The Endicott Studio website here, and our news blog here. Visit Terri Windling's Studio here.